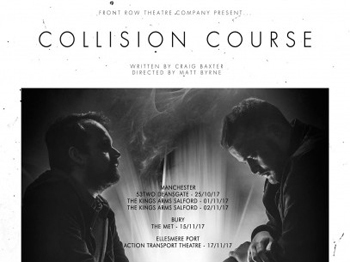 Front Row Theatre are from Preston and were established in 2014 by graduates of UCLAN, and their latest production is a dark and moody suspense drama written by Craig Baxter, Collision Course. The collision in question here being the impending apocalypse which Earth will suffer colliding with another planet. In a dimly lit seemingly make-shift garage two friends sit together, waiting either for the end to come, or for it to pass them by. How long they have been there, they don't remember, they have long since stopped counting and the days are one long endless darkness punctuated by thunder, rain, and other miscellaneous noises which could be associated with extreme inter-planetary tempest (Will Thomson). The mood is intense and claustrophobic and the two actors Mike Coombes (Donal) and Sean Chriscole (Thomas) are well cast sparking off each other excellently. Donal is the realist, the pragmatist, and has prepared this garage according to instructions to ensure that they remain safe; whilst the doubting, cynical and more nervous Thomas finds comfort in religion and questions everything. Both build the drama superbly and are extremely watchable actors, and despite the script's pedestrian predictability, they are engaging, real, and consummate. Sadly the script was something of a let down for me. Even though there is some gentle humour nicely placed in there, and it does have some lovely quotable lines, "Music has the power to keep memories alive", it simply didn't thrill. We are told very early on that Tom is Christian, and this becomes a theme throughout the play, so when his maniacal blaming of Donal's atheism leads to the final cathartic moment, it comes as no surprise whatsoever. We are shown very early on that Donal has a bad cough and so his fate is no surprise either. Thomas is forever talking about wanting to get out of the garage and of course that is exactly what he does in the end. Even all the talk about conspiracy theories and political manoeuvres finds a voice too just before the curtain. I also didn't believe that these two men had been cooked up in this garage for several months at the start of the play. The dialogue and demeanour suggested a much shorter time, and so perhaps after each short scene they could mark more days on the blackboard-style walls to indicate the passage of time, having only a few on to begin with. This would increase the realism of the piece. "Survival is intuitive, religion isn't." The one thing which did come as a surprise, was that it was forever hinted at that perhaps Donal was the manipulator and somehow involved and complicit in the happenings beyond the garage and his insistence that Thomas must stay inside for his own good, and that he will die if he ventures out. Saying "I am your friend" in a rather scary menacing tone, every time he is questioned by Thomas, was not continued and came to nothing. "In order for a great thing to happen, a crisis needs to occur." "This is beyond a crisis - it's a f**ing disaster." Directed by Matt Byrne, the play was more suited to a moody French Noir film than the stage. Long pauses, perhaps too long, and an overlong conclusion to the first act, which made the play seem longer than it should have been, was rather indulgent on the director's part. The tension and the camaraderie playing in apposition with each other was excellently measured however, and two very real and believable characters were brought nicely to life. It is a powerfully and truthfully played piece of engaging theatre, sensibly handled. Such a shame that I found the storyline so obvious.